I will praise Thee with my whole heart; before the gods will I sing praise unto Thee. I will worship toward Thy holy temple, and praise Thy name for Thy lovingkindness and for Thy truth, for Thou hast magnified Thy word above all Thy name. In the day when I cried, Thou answered me, and strengthened me with strength in my soul. Yea, they shall sing of the ways of the Lord, for great is the glory of the Lord. This is the testimony of John, when the Jews sent to him priests and Levites from Jerusalem to ask him, "Who are you?" And he confessed and did not deny, but confessed, "I am not the Christ." They asked him, "What then? Are you Elijah?" And he said, "I am not " "Are you the Prophet?" And he answered, "No." Then they said to him, "Who are you, so that we may give an answer to those who sent us? What do you say about yourself?" Now they had been sent from the Pharisees. 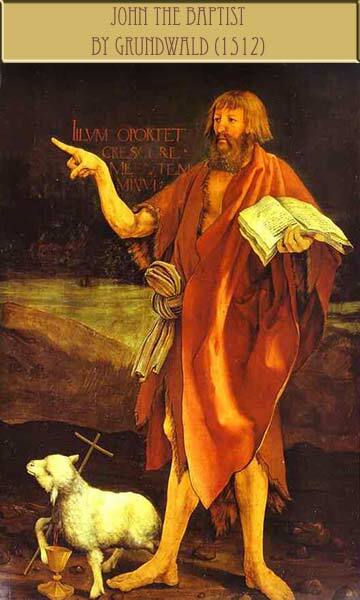 They asked him, and said to him, "Why then are you baptizing, if you are not the Christ, nor Elijah, nor the Prophet?" John answered them saying, "I baptize in water, but among you stands One whom you do not know. It is He who comes after me, the thong of whose sandal I am not worthy to untie." In this passage, John the Baptist recalls the prophecies of Isaiah, that a child would be born who would bring redemption to Israel and to mankind at all ends of the earth. He announces the coming of Christ to all who will listen, saying that there will be one who comes after him, who will baptize us with the Holy Spirit and redeem us from our sins.